Additional Bathroom – If the thing you hate the most is fighting over one or two bathrooms, adding another one is a great idea. You can add a full bathroom to create a second master suite or put in a half bath that will reduce the demand on the bathroom(s) you have now. In-Law Suite – The rising cost of retirement homes is driving many families to consider becoming multi-generational households. It can also be ideal to have parents in the home to assist with childcare. This can be a win-win-win by saving you money, them money, and giving your children fond memories of their grandparent(s). Enlarge Small Room – Home additions do not have to be an entire room. You can also expand one or more rooms to make them larger. This could be done to add a walk-in closet, for example. 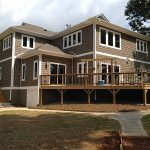 Income Production – Using the same concept as an in-law suite, home additions can also become a rental efficiency suite. This can be accomplished in many ways, such as converting a walk-out basement, garage, or building on top of the garage or another part of your home. Specialty Room – Think about something you’d love to do if you had more room and home additions can make it happen. How about a hobby room, media room, wine cellar or a laundry room that isn’t in the basement or garage? If you can imagine it, a contractor can make it a reality. Here at Chad Goodin Signature Homes, we have a strong background in custom homes, which puts us in the unique position to handle custom home additions as well. We stay in touch with our clients every step of the way, so you can be confident that your project will reach completion on time, on budget, and to your complete satisfaction. Call us today to learn more!